We spent most of last week cutting and grinding bits of metal. 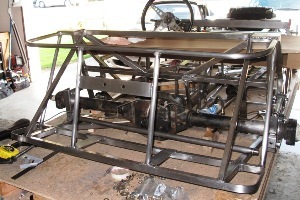 Besides finishing up the new rear axle bracket, including all six cone spacers, we cut and drilled all eight tabs for attaching the scuttle to the frame, and all three tabs for mounting the nose to the frame. With the fabrication of these last few pieces we'd like to think that the cutting and grinding stage of the project is winding down, but probably not. 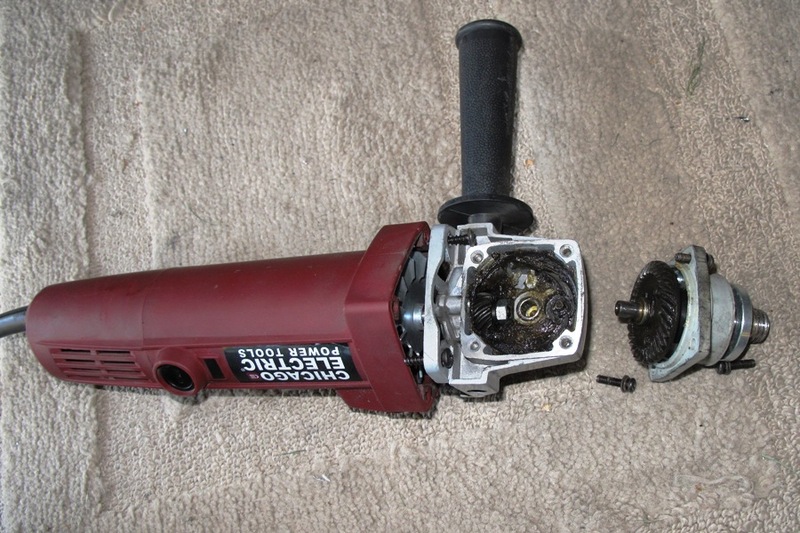 For the last month or so our angle grinder has been making funny noises, and by "funny" we mean a loud bang when it starts up, and a whirring noise like a jet engine when it shuts down. Since it seemed to work okay in between, we more or less ignored the noises, although we did tend to point the thing away from us whenever we fired it up, in case it exploded into a million pieces. But the other day, while grinding welds on the scuttle, we idly noticed the angle grinder was held together entirely by Phillips head screws. So we got out a screwdriver. We were sort of impressed by the guts of the thing. First of all, the gears in the head looked pretty massive, at least for a $20 angle grinder. There was also a ton of grease inside, which we took as another good sign. Right below the pinion gear on the motor shaft was a short splined section, below which was a cheap-looking sheet-metal fan. The fan was loose on the shaft, so we pushed it back onto the splined section, and immediately it slipped off again. So, satisfied we'd done all we could, we reassembled the grinder and went back to work on the scuttle. Despite the obvious flaw in the mechanism, I think the fan actually works. I believe the initial bang is the sound of the fan pulling itself forward like a propeller and engaging the spinning motor shaft, and the whirring on shutdown is the sound of the fan continuing to spin long after the motor shaft has stopped. So it's a little disconcerting, and no doubt the rude engagement of the fan is taking its toll on the device, but now that we know what's going on we at least feel better about using it. We expect some day the fan will disintegrate completely, and hopefully then the noises will stop. Without telling anyone, at least until now, we quietly moved the holes on the spare tire mount closer together. 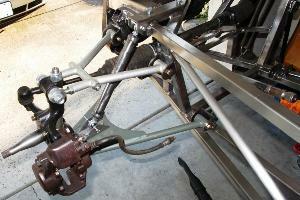 The mount, a 1/8" steel strap welded to the X tubes at the back of the frame, originally had two holes 4-1/2" apart. We moved them 3-3/16" apart. We did this in lieu of lowering the mount itself, which was our other option for repositioning the spare tire, which was too high. Our earlier exhaustive research on the subject sadly misinformed us about this, probably because we didn't look at the pictures close enough. A properly-mounted spare tire extends 4 to 6" above the top of the chassis, but also 2 to 3" below the bottom. It turns out that the 2" steel strap welded between the X tubes doesn't actually support the tire, but only keeps it from flopping around on the road. The spare tire is actually supported by a cradle, a steel hoop made from 3/4" tubing, attached to the bottom of the frame. The tire needs to fit partly through this hoop or cradle, and extend an inch or two below it, therefore ergo sum our need to lower the spare tire an inch or two. Lowering the mounting strap itself would've been one of those painful cut, grind, and weld operations that we've become all too familiar with lately. To avoid this, we chose the rare option 2, which was to move the two holes on the strap closer together. Our original 4-1/2" separation was determined from the MGB wheel stud spacing of 4x4-1/2, which, like TV screens and computer monitors, is a diagonal measurement (actually, bolt circle diameter). Based on this, and also on our many years of study of seventh-grade algebra, we were able to take that 4-1/2" and calculate the distance between adjacent wheel studs as 3.182". So instead of mounting the spare tire on diagonal stud holes, we can now mount it on adjacent holes, which lowers the tire by some appreciable amount, the exact distance which we'll leave as an exercise for the reader to calculate. Just for reference, it looks to me about an inch and a half, so if you come up with a result between 1 and 2 inches (hint: divide 3.182 by 2), you're good. Lowering the tire this way has one added benefit, in that the Rostyle spokes look much sharper in a plus (+) configuration than they do in a cross (x) configuration. Obviously this would be more apparent if we had an actual photograph of a Rostyle wheel, and we can do that at some point, but for now you'll have to take our word for it. With the Locost almost ready for wheels, we've been a little concerned lately about our shocks, which you may recall were made of wood. The compressive strength of wood is pretty impressive, at least until it splits at the bolt holes and fails catastrophically, sending the Locost into a wild spin. Not that we expected to do a lot of driving with the wood shocks. But you never know. So we went ahead and made some new shocks out of metal, using hardware borrowed from the mock-up frame and spare A-arm tubing, and we expect these to be able to hold the car up for the rest of the build.